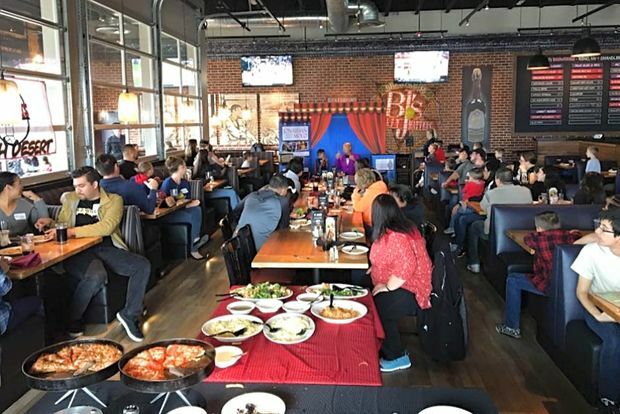 A Chicago chapter of Boston-based "Autism Eats" is helping families enjoy a dinner out together. EDGEWATER — A group new to Chicago is helping parents of children with autism have an experience that for them is often rare: a fun, affordable and low-stress night out to dine together. Norwood Park resident Shannon Dunworth heads the Chicago chapter of "Autism Eats," an Andover, Mass.-based organization that launched two years ago and helps families eat in restaurants without the feeling of judgment from other diners. It's a situation Dunworth knows well as the stepmother of 14-year-old Aidan, she said. "You're very conscious of other people around you," she said. "Sometimes people are staring, sometimes the restaurant environment around you isn't very good. It's not a very calm experience for a lot of families with kids with autism." It can be challenging to dine out with children who have autism for several reasons, Dunworth said. Among them may be a child's impatience between visits from wait staff or when it's time for the bill, a tendency to get up and want to walk around, and shouting or making loud noises that could disrupt other patrons. In addition, the normal stressors of a restaurant experience — like long lines, wait times, loud music and lighting that is too bright or too dim — are amplified for kids who are prone to sensory stresses. With the Autism Eats program, restaurants agree to close their dining rooms to the public and offer a buffet-style, full-course meal, inviting only families with children who are autistic. Tickets are sold in advance, including tax and tip, so families can leave when the meal is over. "If you have everyone in the dining room experiencing the same thing, and knowing already what to expect, it can set up a more calming, more fun situation for dining out," she said. "You just want to have similar experiences that other families do ... so you customize the situation so you can have that." Dunworth is in the throes of planning the Chicago chapter's first dinner from 5:30 to 7:30 p.m. March 18 at the Fireside Inn, 5739 N. Ravenswood Ave., in Edgewater. Tickets are free for patrons 14 and younger, and $34 for older teens and adults. The spread includes a kids buffet of chicken tenders, mini-burgers, pizza and pasta, while the adult menu offers chicken Vesuvio, pasta, roasted vegetables, salad and more. Unlimited pop, tea and coffee are included. Eli's Cheesecake is donating dessert, and each child will get a squeezable toy donated from a pediatrics company. The meal also offers a chance for siblings who aren't on the autism spectrum to relate to and interact with other siblings in similar situations. Ultimately, Dunworth said it's a chance for the whole family to enjoy a night out on the town together among people who understand. "It's a community that understands what's going on," Dunworth said. "You know, you want to dress the kids up, you want to take them out on a Saturday night, but ... you can go into a situation where things are going pretty well and then you get to the restaurant and it's like, everything goes wrong." "It's a way to alleviate all that," she said. The Fireside meal won't be the only one for Chicago Autism Eats — Dunworth said she is planning to schedule them quarterly throughout the year, which might or might not recur at the historic Fireside. Though the March 18 event is only meant for 50 guests, down the line Dunworth's "dream" would be to organize a meal for as many as 300 people at once. Tickets for the event have already been selling, with the first purchase coming all the way from west suburban Aurora. Parents from other suburbs across Northern Illinois who have heard about the dinner also have reached out to Dunworth, many asking how to start chapter of their own. For now, Dunworth said she's hoping for a full turnout at the Edgewater event that will unite families with similar dynamics and strengthen bonds between family member. "This will bring the whole family in. We wanted the entire family to come," she said. "It's for all kids ... to see, 'Hey, there's somebody just like us.'"